Basketball for grades 3-6 takes place in the winter and spring months. Beading club grades 4-6 and 7-9. Students will learn multiple styles of beading and projects will be determined by skill level. Book Club for both grades 3-6 and 7-9. Elementary meets Wednesdays at lunch and JH on Mondays after school once a month. Students who love reading should join the book club to spend time with others of the same interests, and expand the types of books they choose. Choir for elementary students in grades 3-6 runs Tuesdays at lunch. LSAA teams for our junior high students: cross country, volleyball, basketball, badminton, track and field. LSAA scorekeeper. Our junior high students who want to support teams can come out and be scorekeepers for volleyball or basketball. Me to We Club for junior high students. This is a social justice club that offers students the chance to make a difference in our world. It is designed to transform students into world changers one action and experience at a time. Better choices make a better world. This club meets at lunch time. Spring Production for junior high students. Our students write the play, call the show in the booth, and can participate by acting, singing, dancing, or being a member of the backstage crew. Auditions start in October and rehearsals continue weekly until our Production in the first week of May. Running Club for elementary students meets at lunch time on Tuesday and Thursday in the fall. Scrapbooking club for students from grades 4-9. Students learn different techniques in a variety of projects. Skating at Nicholas Sheran Arena takes place on Thursdays after school for all students and families from October – March. Helmets are required. Also, if you have an idea for a new club, come talk to me as we are always changing what we do based on students’ interests. I encourage students to come out and join in a club or an activity as it is a great way to not only develop your skills, but also to meet new people. When you leave your activity, don’t forget to say thanks to the volunteers who have made it possible for you to participate. 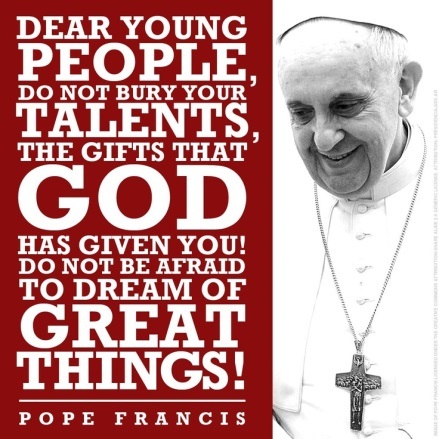 Pope Francis words for young people.